After living in New York for, oh, 17 years, I went to the Lunar New Year parade in Chinatown for the first time last weekend. Having a toddler who loves a party encouraged us to go as a family. We usually go the opposite direction of crowds, so we must really love this kid! Here's my review if you live in New York, have a young kid and you're on the fence about going: You gotta check it out atleast once! 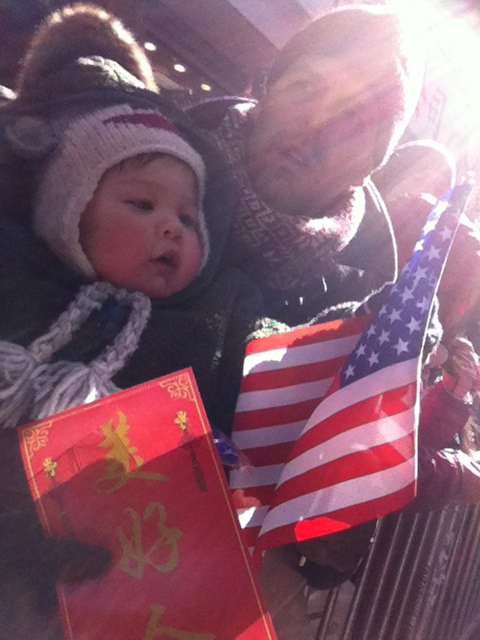 Here are the tips I'd give my friends with kids for next year's parade! 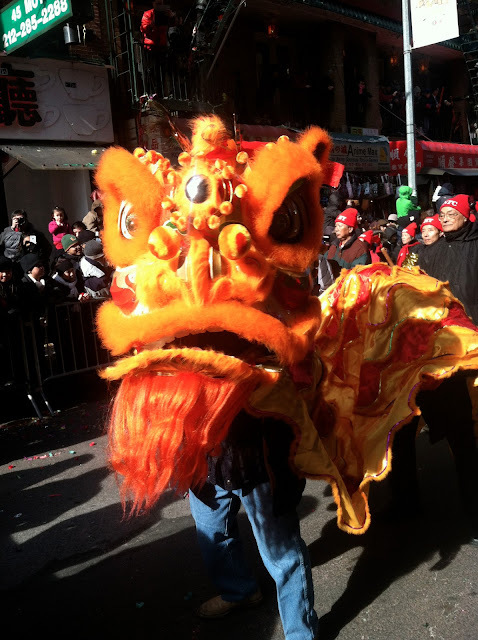 This website says the parade is always on a Sunday in February...is the lunar new year always in February? I have no idea. -Go early! 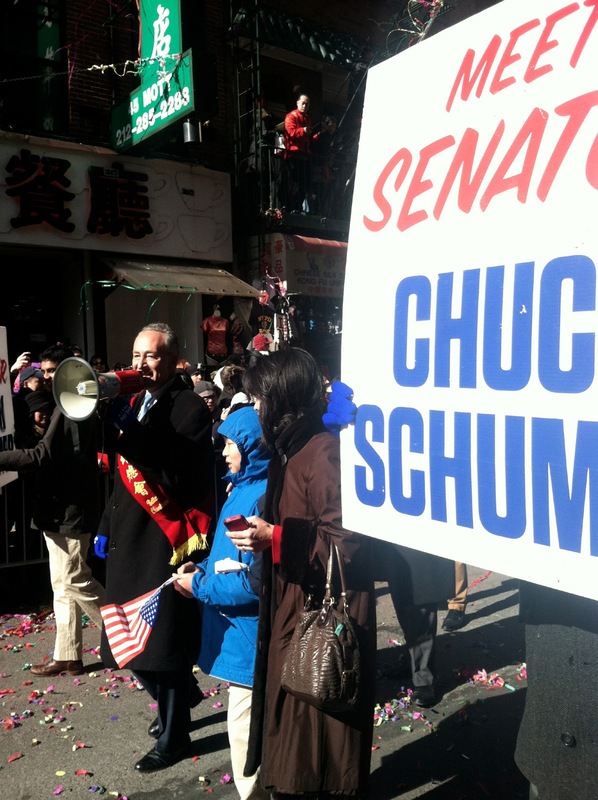 The parade starts at 1, but we got to Chinatown at 11:30 am, so we could have an early lunch. Turns out we came at just the right time to beat the lunch rush. 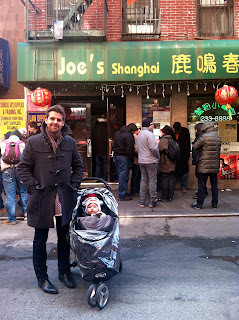 When we got to Joe's Shanghai, there were maybe 15 seats still open and by the time we left there were 20 people waiting outside for tables. Go early and eat in Chinatown. It's fun to make the day about Asian culture. -Bundle up! You get way colder standing in one spot waiting for a parade to start than walking around. The weather at the parade was seriously arctic this year, so I was glad I had my Uniqlo HeatTech on, two cashmere sweaters, the whole nine yards. Well, I wished I had worn two pairs of wool socks instead of one. I was glad I had left the rain cover on my son's stroller. It protected him from the angry gusts of wind. 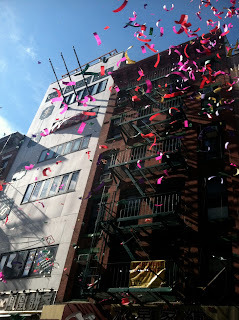 -Get some confetti canons in Chinatown when you get to the parade, which they were selling all over Chinatown in boxes outside storefronts. The canons we got were two for $5. 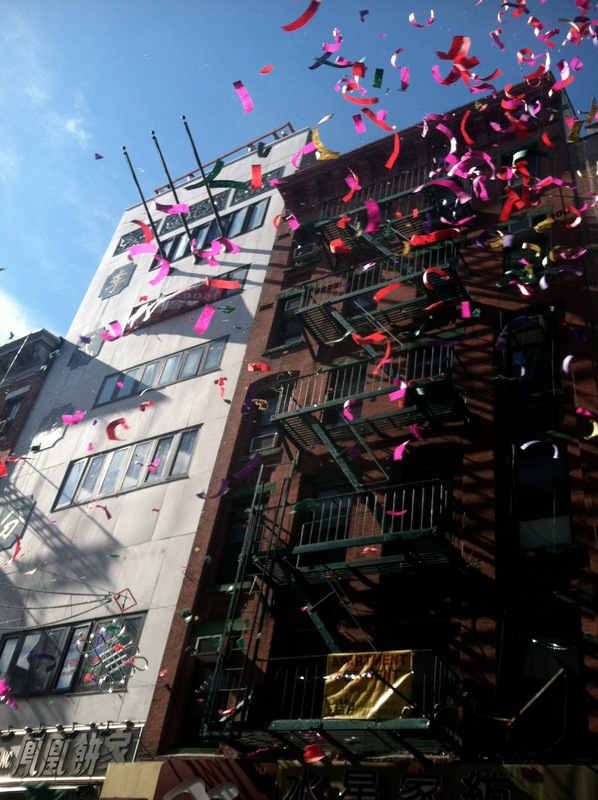 I've never seen these things, but they shoot confetti way up in the sky and kids love it. You twist the base of the canon and it releases an air pressure thing that activates the confetti. They get you in the celebratory spirit. Explosive fun! -Find a spot! There were still some empty spots around the barricades on the parade route at 12:30 (the parade starts at 1 pm), if you want to be right in front of the action. If your kid can sit on your shoulders, you probably don't need to be right up front. -Get set up near whatever exit transportation you have planned. We weren't sure if there was an ideal spot (and I don't think there is) to watch the parade from, so we just got set up pretty close to the subway station we used to get back home to Brooklyn. There are a lot of streets and street crossings closed off, so you want to be a bit strategic about your exit. 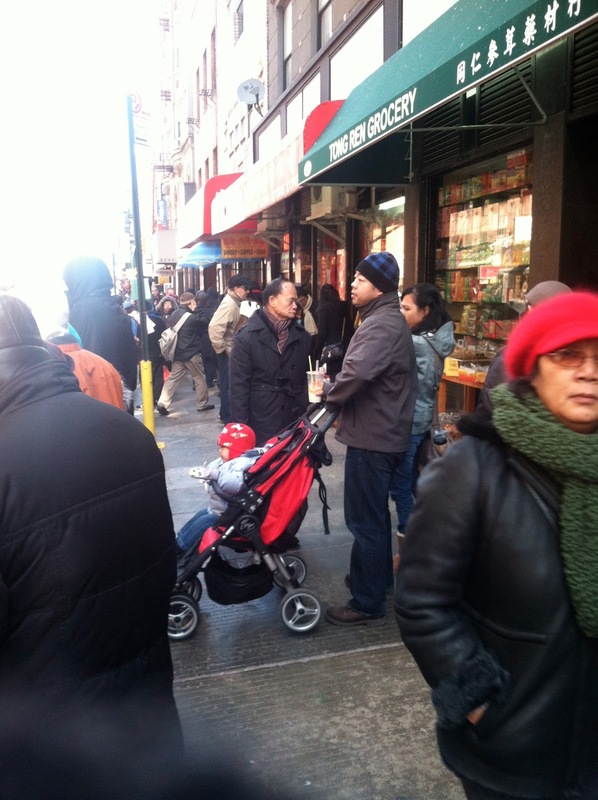 Also, the crowds make it a little more challenging to get around, especially if you have a stroller. -It was fine to bring a stroller and I'm glad we did (instead of using a carrier). We had to fold the stroller up in the crowded restaurant at lunch. Once we were situated on the parade route, our sat in the stroller until the parade started. It would have been too much carrying and too cold without a stroller. -Consider leaving early! Our butts were freezing, plus we had delayed Greyson's nap in order to watch the parade, so we left after about 20 minutes of the parade. We had heard enough drums, seen enough dragons, cheered enough marching band members and seen enough politicians. -Don't bring a double-wide stroller to the parade. I don't even know why people have these things in New York. I think it's so rude to be like, I'm going to take up the whole sidewalk and not care if anyone else has room to walk. There are so many strollers where the kids can be front to back instead of side by side. And then at a parade, a double wide is beyond ridiculous.